Hi everyone! I hope that you enjoyed the weekend. We did a little bit of exploring our neighbourhood, checked out a new (to us) cafe, and did a LOT of work around the apartment. I am happy to report that my office space is almost fully functioning, and that we now have shelves (photos to come soon)! The leaves have already been changing colour, and I snapped a photo of a particularly firey tree this morning while walking Rudie. I'm embracing all things pumpkin + apple + spiced + autumn hued, and enjoying curling up under covers as we enjoy watching the first season change together in MA. So in honour of all things autumn, I've decided to share a few links that scream October leaves. This print from Etui, on Etsy is super cute. I love the palette. I want to live in a burgundy + olive + rust + ocher coloured world all year long. Freshly baked, home made treats definitely remind me of autumn. Memories of baking apple crisp with my dad (with apples from my grandfather's trees) when I was little, come to mind. Unfortunately for my autumn baking - right now, I have an abundance of bananas in my kitchen thanks to a mix-up when I ordered my groceries online. So what do you do when life gives you an excess of bananas you ask? Why make banana bread of course! I've been searching for the perfect recipe. This one from Tattooed Martha looks absolutely delicious (and it has rum + coconut - yummy)! This Copper Striped Pumpkin DIY from Homey Oh My, may be super simple, but certainly doesn't lack flair! 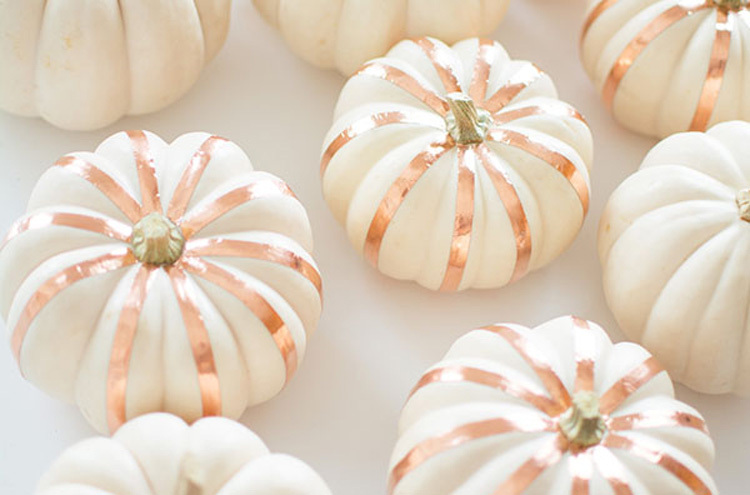 I love love love the look of white pumpkins/gourds, especially when paired with metallics and lovely autumn hues. I so wish that I had a doorstep to decorate this time of year. BUT, for now, I will have to stick with decorating my window sill, and making pretty table centrepieces. 5) Do you have a list for what you would like to accomplish this fall? I have some traditions that I usually partake in like, a trip to the farm in a neighbouring small town on Thanksgiving weekend to buy pumpkins + pie, pumpkin carving at my parents' place, celebrating Pedro's birthday by dressing up and attending our friends' Halloween party... But, because we are so far away from home (and all those traditions), it's time to make some new ones. Gala Darling posted this list on her site with lots of ideas for activities to complete this season! I keep walking by this tree in my neighbourhood, and think it's the prettiest. I took the above photo with my phone this morning while walking my pup - so hey, already completed one!